Are you an affiliate marketer looking to generate more revenue from your website? Affiliate marketing is one of the best ways to make money online. With the right set of plugins, you can increase the affiliate revenue from your website exponentially. In this article, we’ll share some of the best WordPress plugins for affiliate marketers. Affiliate marketing is one of the most reliable ways to make money online. With affiliate marketing, you choose products you like, promote them online, and earn commissions when someone purchases the products through your referral link. Having the right set of plugins in your toolbox makes affiliate marketing easy and also helps you earn more revenue from your site. Organizing and cloaking your affiliate links. Affiliate management software for sellers. Popup solution for displaying affiliate links at the right time for the right users. Analytics solution for tracking your affiliate link clicks. Pretty Links is yet another plugin that enables you to easily cloak the affiliate links you promote on your website. It even allows you to easily set up server-side redirection, including permanent 301 and temporary 302/307 redirects. Moreover, Pretty Links also helps you create short links automatically for your posts and pages and shares them on your Twitter with a customizable message. Get started with Pretty Links today! Affiliate WP is the best affiliate management plugin for WordPress. It’s developed by the same folks behind the renowned Easy Digital Downloads plugin, which is listed as one of our best WordPress eCommerce plugins. If you’re selling a product on your WordPress website and want to create a fully-fledged self-hosted affiliate program, then AffiliateWP is the best choice for you. AffiliateWP is easy to set up, offers seamless integration with your eCommerce product purchases, accurately tracks your affiliate sales, and more. Get started with Affiliate WP today! OptinMonster is the best lead generation and popup solution for your affiliate website. With OptinMonster, you can show a personalized popup campaign based on individual visitors behaviors making your messages more likely to convert. For example, on a product review page, you can show a popup with an affiliate link promoting the same product. Increase revenue: Popups triggered based on individual user behaviors are more likely to drive clicks and earn revenue. Less annoyance: Unlike other mediocre popup solutions, OptinMonster comes with tons of targeting options, so you can display the right campaigns to the right users at the right time without annoying your regular visitors. 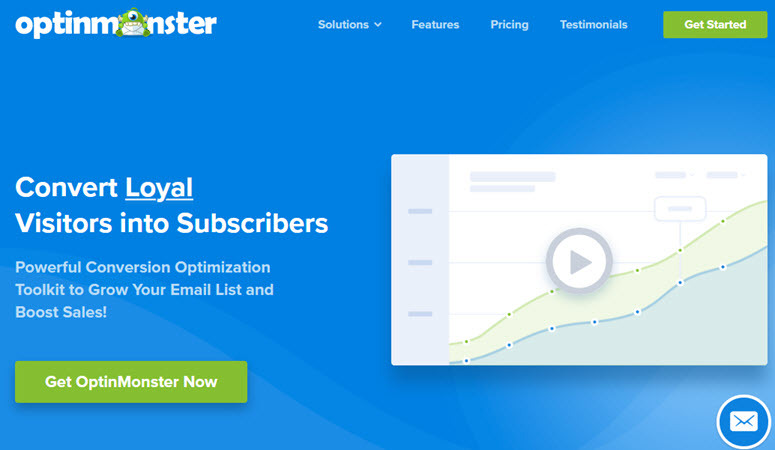 Seamless integration with your email newsletter: OptinMonster offers seamless integration with your favorite email marketing service, so you can grow your email list while growing your affiliate revenue. WPForms is one of the best contact form plugins for WordPress and it allows you to easily create contact forms on your affiliate website. Potential customers are more likely to purchase a product recommended by people they know. By having a contact form on your site, you’re making it easy for your visitors to reach out to you. WPForms also let you easily integrate your form with an email marketing service, so you can build connections with your visitors. By building a connection with your visitors, you can recommend products and convince them to make a purchase. AdSanity provides an easy way to insert affiliate banners inside posts or sidebar widgets. You can manage your affiliate campaigns and ads within your WordPress admin panel. The main benefit of using AdSanity is you can display affiliate banners only during a specified timeframe on your website. With its performance report, you can easily track the performance of each banner you publish on your site. EasyAzon makes promoting Amazon products easy on your WordPress site. With Easy Azon, you can find relevant Amazon products right from your WordPress dashboard without having to manually find products from Amazon.com and create affiliate links. Get started with EasyAzon today! MonsterInsights is the best Google Analytics plugin for WordPress, but it also lets you enable affiliate links tracking on your website with ease. With affiliate links tracking enabled, you’ll get data-driven insights in your Google Analytics that help you generate more revenue from your affiliate website. You can identify the highest earning pages on your site. Get content ideas for your blog that are geared towards earning more affiliate revenue. With MonsterInsights, you can also track your AdSense earning, ecommerce transactions, and download tracking in your Google Analytics account. Amazon Product in a Post Plugin enables you to quickly add a formatted Amazon product in your blog post. In order to add an Amazon product on your post, you’ll need to have an Amazon affiliate account and Amazon Product Advertising API keys. After configuring the keys, you can easily add Amazon products within your blog posts. Get started with Amazon Product in a Post Plugin today! WP RSS Aggregator allows you to conveniently fetch content from your affiliate networks into your WordPress website. For example, retailers like Amazon let you create product feeds with your affiliate ID. With WP RSS Aggregator, you can set up product pages by importing the feeds, or even create autoblogs with ease. This way, you can automatically fetch products as posts into your WordPress blog. Plus, it’s always updated with the latest changes. Yoast SEO is one of the best WordPress SEO plugins and will help you attract the right traffic to your affiliate website. Yoast SEO takes care of all the technical SEO optimization you need for your site. It forces you to choose a focus keyword when you’re publishing content, and then makes sure that you use it appropriately on that page. Yoast SEO is the most popular WordPress SEO plugin and it’s a MUST HAVE for every website. Rel Nofollow Checkbox adds a checkbox option in the insert/edit link popup that allows you to easily add a nofollow attribute to your links. By adding a nofollow attribute to your affiliate links, you tell search engines to not pass link juice to those links. That means that you can promote your affiliate products without worrying about getting penalized on Google. Get started with Rel Nofollow Checkbox today! We hope this article helped you find the best WordPress plugins for affiliate marketers. We believe that all of the above plugins are essentials and must-haves for affiliate marketers using WordPress. Driving more targeted traffic is essential to increase your affiliate revenue. Check out the best SEO tools to grow your website traffic, fast.